I'm finally coming out from under the oppressive, depressive fog, and, for the first time in a long time, I'm feeling really, really good. When Mom was growing up in Germany, if someone got hurt, an adult would give them a sugar cube, and once the offending "owwie" stopped hurting, the kiddo could eat the sugar cube. I've talked about Genevieve's sugar-induced transformation from adorable Mogwai to terrifying Gremlin. But extreme times call for extreme measures. Genevieve - like many kids - was terrified of shots. The mere mention of them would make her practically apoplectic with fear. But I cracked it, courtesy of some inspiration from Halloween. Last year, Genevieve cut her finger on a cheese knife [while my most excellent and very capable mother was supervising, because even supervised, accidents can and will happen] - which was the first time we tried the 'M' Method(TM) to get her to calm down and put a band-aid on. Up to that point, she told me she was just planning on keeping the paper towel on her finger forever. "Okay," I said, fetching one tiny M&M** (which is just an "M"), like the stingy, joyless, sugar miser/ Tsugar Tsarina I am, "When it stops hurting, you can eat the M."
Well, wouldn't you know it. The paper towel came off, and nobody needed stitches. Phew. Fast forward to last month, when we needed to get our flu shots. Genevieve packed two special pieces of Easter chocolate (YES, we still have Easter chocolate in the freezer, see "Tsugar Tsarina" above) in each ziploc bag so that each kiddo would have their own, and off to Kaiser we went. "Flu shots, YAY!" Rex chanted, all the way there. In the minivan. In the waiting room. In the injection room. He was so enthusiastic that a doctor (who was updating her charts when we came in) walked over to see our own young vaccine enthusiast for herself. Rex was all smiles and excited. Genevieve wanted to go first, so if Rex screamed, she wouldn't have to stay and listen (two adults meant that they could wait out of earshot). Genevieve was brave, right up until the needle was prepped. Then came the anxiety. "I'll hold you. Sit on my lap, put your face against my shoulder," I said, "And here, hold your chocolate in your other hand." 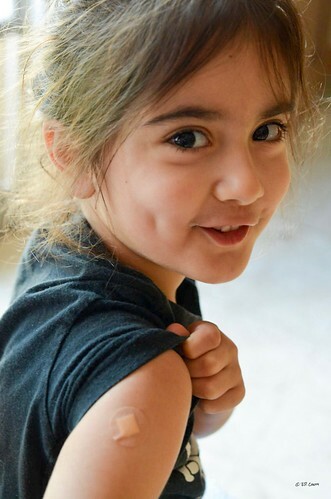 Genevieve, who is terrified of needles, gave no more than a slight gasp when she got her flu shot. That's it. No screaming. No tears. A small, quiet, gasp. And then she was done and eating her chocolate. -- and abruptly stopped when I handed him his baggie of chocolate. "Here's your chocolate, buddy," I said, deftly handing him to his father (because two year olds and chocolate are a sticky mess). Everybody was happy, everybody got vaccinated, and then everybody went together to get ice cream. ** If you're not thrilled about the ingredients of M&Ms, I highly recommend the Unreal Candy Coated Milk Chocolates. They. Are. Delicious. They don't come in "fun sized" bags, that I've been able to find, so you'll have to DIY that business. You are the BEST mom, with the BEST mom...!!! This is wonderful! This is really cool. I’m so glad you have found a way to alay their anxiety about shots. I have been INSANELY blessed with two kids who do really well. Abby cries for about 30-60 seconds and then lectures me all afternoon/night about how shots hurt. Sebastian is so quite, I’ve literally had a room full of nurses watching in disbelief. Turns out to be a great thing, since he needs allergy shots (& has been getting them since age 4). I took Halloween candy with us, put it on the table, said she could have it as soon as the nurse was finished. She wanted to a) see what her bandaid pattern was (dogs) and b) was grabby hands for that chocolate. (She’s 2.5, and had forgotten the chocolate was hers in the first place) Then we had to go potty at the clinic, because EVERY bathroom is fascinating when you’re recently trained. (Puts on Angry White Lab Coat of Child Psychology) what kind of idiot would go after a mom who uses a reward to help her kids discover their ability to control their own behavior in a painful situation? That's in the best tradition of teaching behavior management. It's only a sugar cube/m&m!!!!!! Do I need to come up there and (clinically) set a few people straight for you?? Would she pack me some really good chocolate so I can pay $140 for my anti-shingles vaccine? And then I'll need her again in two months when I'll need my second one.